Today is Christmas Eve, 2013, the day most of us choose to celebrate the birth of Jesus Christ. I say “choose,” because no one knows for sure on just what day Jesus was born. In fact, even the year is disputed. Getting right the day of his birth is not important. That he was born is the single most important event is history. For those of you who found time to read this humble blog entry, here are a few notable events that occurred on Christmas Eve in years gone by. One of my most memorable Christmas Eves was that of 1968. It was the 150th anniversary of “Silent Night, Holy Night.” I attended midnight mass at St. Stanislaus Church in my hometown of Bay City, Michigan. St. Stanislaus is a neo gothic church in what was earlier the Polish section of the city. Outside everything was covered in snow. The beautiful crowded sanctuary was not much warmer. At the front of the sanctuary were fresh cut pine trees and a lovely manger scene. The smell of fresh pine mingled with the smell of incense drifting through the air, added to the ambiance of the moment. Since it was the anniversary of the first performance of “Silent Night, Holy Night,” the church’s orchestra and choir performed it in numerous languages, including of course, Polish. Merry Christmas to one and all, and until next time, do good, be good, and always live under the mercy. Jane Austen’s most popular novel, Pride and Prejudice, was published two-hundred years ago. Since then, there have been countless adaptations, sequels, prequels, and spin-off stories of her works created in various mediums. Many would argue that Colin Firth’s iconic performance as the dashing Mr. Darcy in the 1995 mini-series of Pride and Prejudice may have sparked the renewed Austen fervor that has continued into the twenty-first century (Alexander). In recent years, Austen fans around the world have been focused on reliving, reviving, and reinventing her famous Regency-era stories, proving how timeless they truly are. 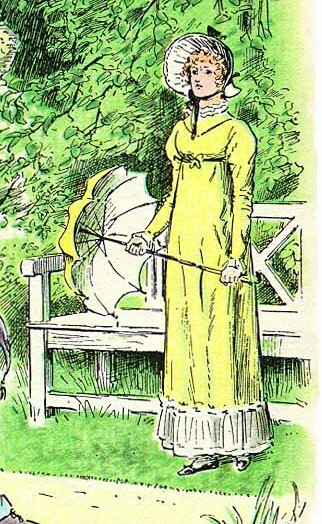 The fans who take joy in reliving the stories of Austen in the Regency style are generally referred to as Janeites. The term was coined in 1894 by George Saintsbury, a literary critic, in his introduction to a new edition of Pride and Prejudice. Rudyard Kipling helped popularize the term with a short story called “The Janeites,” which is about “a group of soldiers brought together by their passion for the works of Austen” (Kelly). In contrast, the word in popular culture now describes Austen fanatics, the majority of whom are female. Contemporary Janeites are famous for dressing up in Regency-era costumes to attend tea parties and balls, writing fan fiction about Austen’s most beloved characters, and forming societies with other fans. The Jane Austen Society of North America (JASNA) is among the most popular of such societies, with over 4,500 paying members (Kelly). JASNA members can attend an annual three-day fan conference that features “speakers, entertainment, tours, banquet, and Regency ball” in addition to having access to newsletters and local branch group meetings; they also have the opportunity to take “members-only” tours in England to visit the famous locations associated with Jane Austen (JASNA.org). The Austen obsession of these fans might sometimes border on ridiculous; earlier this year, the film Austenland was released, a lighthearted comedy inspired by the silliness of the Janeites. Based on the 2007 novel by Shannon Hale, the film follows Jane Hayes—who is a fanatic of Colin Firth’s portrayal of Mr. Darcy—as she checks in to “Austenland,” an English estate set up in the Regency style, where “female visitors pay for the privilege of acting as if they were modeled on the scribe’s plucky heroines, complete with era-appropriate suitors” (Wloszczyna). While some think this type of humor is merely mocking Austen fans, Hale, a self-declared Janeite, defends her story and the intention of the film: “we made it in love, full of warmth and fondness and well-intentioned humor. . . .” She adds, “I do know we were walking that fine and wonderful line: to be the thing and make light of the thing. That’s the only way to do a loving comedy.” After all, Janeites themselves share a striking similarity to the heroine of Austen’s romantic comedy Northanger Abbey; the young Catherine Morland is obsessed with Romantic novels, and the narrator gently critiques her silliness throughout the novel. This fixation even gets the young Catherine into trouble; in writing the character of Catherine, Austen was warning against becoming too passionate with fiction to the point where it interferes with one’s judgment (Austen). Hale’s Austenland may have been drawing attention to this same risk. Not all of Austen’s popularity is attributed to the Janeites, however. Her fame has spread through a number of books and movies which have helped to revive the twenty-first century fascination with Jane Austen. Perhaps the most popular is the 2005 remake of Pride and Prejudice starring Keira Knightley and Matthew Macfadyen as Elizabeth Bennet and Fitzwilliam Darcy respectively, which was nominated for four Oscars. This is not all, however; all six of Austen’s novels have been remade into films or television mini-series in the last ten years. In addition, a film based on the life of Jane Austen was released in 2007; it was titled Becoming Jane and starred Anne Hathaway as the beloved author. The film revolved mainly around Austen’s romance with the Irishman Tom Lefroy (played by James McAvoy), but some Austen scholars bemoan the historical inaccuracy of the film’s representation of this relationship (IMDb.com). Austen’s stories have been remade time and again, but the twenty-first century has brought a unique set of interesting reinventions. The earliest is Bridget Jones’s Diary, a British romantic comedy, which was based on the novel of the same name. The story is a modern-day interpretation of Pride and Prejudice and stars Renée Zellweger as the title character, accompanied by Colin Firth—Darcy from the 1995Pride and Prejudice—as the love interest. It follows Bridget’s journey of losing weight, quitting smoking, and finding love, as recorded in her diary. The Bollywood film industry adapted Pride and Prejudice in 2004, calling their version Bride & Prejudice; it was set in the Indian city of Amritsar and featured the colorful costumes and exciting dance numbers typical of Bollywood films. Though the 2007 film The Jane Austen Book Club—based on the 2004 novel—is not an adaptation of any of Austen’s specific stories, it tells of a book club that assembles to discuss each of Austen’s novels, during which time the events of each of the six book club members’ lives begin to align with the stories from the novels (IMDb.com). While numerous novels and films have remade Austen’s stories in a different setting, the 2008 TV mini-series Lost in Austen takes twenty-first century Amanda Price back in time to the actual story of Pride and Prejudice and puts the novel’s heroine, Elizabeth Bennet, in present day London. By introducing a new character to the classic tale and taking the original protagonist out, the storyline begins to change (IMDb.com). English professor and Janeite Laurie Kaplan believes this mini-series appeals to Generation-Y viewers because of the contrast drawn between the old and new cultures and the confusion which ensues from this; she writes, “Amanda’s physical and verbal style—her cultural baggage—is juxtaposed with the trappings of a Regency comedy of manners, creating exactly the time-travel mix that engages with issues of contemporary culture.” Amanda’s love for the world of Pride and Prejudice, combined with her disdain for her current situation in life, causes her to embrace the opportunity to make her own way in the story world but also to fret when things begin to go awry and characters act contrary to how they do in the novel. Lost in Austen succeeds in altering the original story to suit a younger audience, while not losing the precise social mores which are so characteristic of Austen’s novels, by crossing the two time periods: “Buttressed by anachronisms, the witty intertextuality—the multiple cross-cultural, cross-class, cross-text, cross-media, and cross-linguistic references—takes the viewer backwards and forwards in time” (Kaplan). As far as appealing to a younger generation of viewers and playing off of cultural references, Lost in Austen does well; however, Seth Grahame-Smith’s retelling of the original story in his 2009 novel Pride and Prejudice and Zombies plays even further into the appeal of pop culture. The novel’s back cover claims that it “transforms a masterpiece of world literature into something you’d actually want to read.” Much of the writing in the novel follows Austen’s exact wording, but Grahame-Smith makes some clever revisions. He includes masses of the undead—referred to throughout the novel as the “unmentionables”—and makes certain characters expert warriors, thus adding a layer of action and adventure to the comedy of manners that is the original. It begins with the line, “It is a truth universally acknowledged that a zombie in possession of brains must be in want of more brains,” a play on the original text’s opening line, which reads, “It is a truth universally acknowledged, that a single man in possession of a good fortune, must be in want of a wife” (Grahame-Smith 7; Austen). According to the author’s official website, Pride and Prejudice and Zombies “has sold over a million copies and been translated into more than 20 languages” (SethGrahameSmith.com). For those not into the cultural obsession with zombies, The Lizzie Bennet Diaries offers another modern update to the story of Pride and Prejudice: it is told entirely through a series of three to seven minute video blogs posted on YouTube. This adaptation—conceptualized by the show’s executive producers, Hank Green and Bernie Sue—features Lizzie Bennet (played by Ashley Clements), a graduate student pursuing a degree in mass communications, who documents her life through video blogs for what originates as a class project. She is assisted by her best friend Charlotte Lu, and the videos frequently include Lizzie’s sisters, Jane and Lydia. The show’s one-hundred-episode run featured a total cast of thirteen actors and was made in the span of a year. The method of story-telling was unique not only because the central forum was YouTube video blogs, but also because the production team created a variety of other social media accounts for the characters—on Twitter, Facebook, Tumblr, Pinterest, etc—which were updated “real-time” with the events of the story (LizzieBennet.com). The Lizzie Bennet Diaries demonstrates the potential for new forms of media to be successful on a larger scale. The show won the first ever Creative Arts Emmy in Interactive Media, beating out big-name opponents Top Chef, Oprah, and Nickelodeon. Rachel Poletick, blogger for Yahoo! TV Emmys Blog, attributes the show’s success to the characters’ multi-forum social media accounts, which she believes greatly contributed to user engagement, as well as the show’s fan base sprouting directly out of another project—Lizzie Bennet fans flocked over from producer Hank Green’s fan base of over one million subscribers for his YouTube channel The VlogBrothers. The first Lizzie Bennet episode now has close to one and a half million views. Due to the show’s success and fans’ mourning at its end, producer Bernie Sue pioneered another series of video blogs, this time inspired by Austen’s unfinished novel Sanditon; the completion of that project led to the team’s newest endeavor: Emma Approved, an adaptation of Austen’s Emma (Poletick). A lot has happened with Jane Austen stories and their fans over the last thirteen years. The Janeite societies still prosper, new and innovative film adaptations are continually being made, and popular culture is keeping Austen relevant for younger audiences. The stories have proven themselves timeless; they have endured for over two-hundred years and been adapted to numerous new versions and unique methods of storytelling. The evolution of Austen in the twenty-first century has shown that with the passage of time, there will always be those who travel with the stories into the past, and those who carry them on into the future. Alexander, Bryan. “Colin Firth’s Mr. Darcy is the pride of Austen portrayals.” USAToday.com. USA Today, 24 Aug. 2013. Web. 27 Nov. 2013. Austen, Jane. Northanger Abbey. London: Headline Review, 2006. Print. —. Pride and Prejudice. Gutenberg.org. Project Gutenberg, 2010. Web. 27 Nov. 2013. Grahame-Smith, Seth. Pride and Prejudice and Zombies. Philadelphia: Quirk Books, 2009. Print. Hale, Shannon. “On not mocking Austen (but laughing all the same).” SqueetusBlog. Shannon Hale, 25 Nov. 2013. Web. 26 Nov. 2013. IMDb.com. IMDb.com, Inc, 2013. Web. 26 Nov. 2013. JANSA.org. Jane Austen Society of North America, 2013. Web. 26 Nov. 2013. Kaplan, Laurie. “Lost in Austen and Generation-Y Janeites.” Persuasions On-Line. Jane Austen Society of North America, 2013. Web. 26 Nov. 2013. Kelly, Jon. “Janeites: The curious American cult of Jane Austen.” BBC News Magazine. BBC, 27 Jan. 2013. Web. 24 Nov. 2013. LizzieBennet.com. The Lizzie Bennet Diaries, 2013. Web. 26 Nov. 2013. Poletick, Rachel. “How ‘The Lizzie Bennet Diaries Won Over and Audience and the Emmys Jury.” Yahoo! TV Emmys Blog. Yahoo TV, 22 Aug. 2013. Web. 26 Nov. 2013. SethGrahameSmith.com. Seth Grahame-Smith, 2011. Web. 26 Nov. 2013.